Milltown Village is located in the South-West of Ireland in County Kerry. 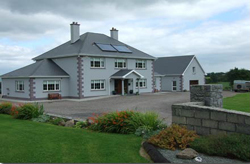 Situated on the Iveragh Peninsula on the N70 Ring of Kerry road. Milltown is located on the N70 road between Castlemaine and Killorglin. Milltown is home of the annual World Bodhran Championships. The village is the perfect base for touring the Ring of Kerry and the Dingle Peninsula. Aeroplane: Kerry Airport is the closest airport to Milltown Village - 16km. Click here for details on Irish Airports. Sorry there is currently no listings for Milltown.